Seeking volunteers for our overnight weekend camp, Camp Erin, for children grieving the death of a loved one. Camp Erin is a bereavement camp offered to children ages 6 through 17 and includes age-appropriate discussions and fun-filled creative experiences designed to help children share their feelings with their peers who are in similar situations. Camp Erin is offered in partnership between CaringMatters and Bar-T, a premier childcare provider. We need adult volunteers who serve in a variety of roles. We especially need volunteers who can serve as a "Big Buddy" to a child who has recently experienced the death of a loved one. A Big Buddy provides caring support to his or her assigned Little Buddy by listening to the child discuss the loss, both in the supervised group sessions and throughout the camp events. All Camp Erin volunteers must go through the basic three-day volunteer training and an additional one-day training held on a Saturday. Volunteers must be 21 or older. All volunteers must go through a background check. 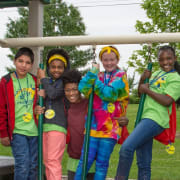 Camp Erin will be held Friday, May 3- Sunday, May 5, 2019.